What a glorious spring day! For all my complaining, I’m glad this winter was long and hard. The warmth of spring is that much more treasured when it comes. Most of the time, the storm is my preferred metaphor for hardship and suffering, but I’ve come to realize that it doesn’t always come to us like storm… quick and violent and then spent. Sometimes pain is slow. Like a long, hard winter. Icy cold, relentless wind, bleak landscape. It takes patience to endure. Please reveal yourself to me, O merciful Lord. Show me that you are active in the midst of this pain. Help me to remember that resurrection and new life come to everyone in your time. 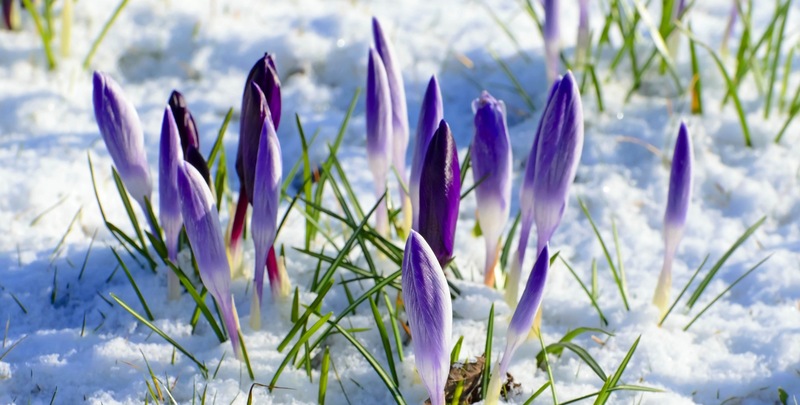 Lord, in your tender mercy, awaken us to little moments of everyday resurrection – like tiny, early signs of spring in the midst of the harshest winter. Sometimes the tiny resurrections are the only things we can see through the haze of agony and ache. A moment of connection with someone who understands my struggle. That comforting realization that I am not alone. That dawning understanding that I am NEVER alone, for God is with me always. Open our eyes and ears, O Lord. Make us attentive to your love and compassion in all those we meet today.